Flying to the Faroe Islands. Flying to the Faroe Islands – a truly uplifting experience. The unique experience of flying to the Faroe Islands starts at the check-in. Most frequent flyers, especially business travelers, will be used to the relative anonymity and solitude of aeroplane travel. Standing in the check in queue, reading the print off the back of your passport to avoid eye contact with the other strangers in the queue, willing the check-in to be over quickly so you can ditch the baggage and move on to the tiresome, but necessary, routine of a gradual striptease at the security check. Proceeding to the allotted gate number to join the other travellers, immediately burying their heads into various i-devices to re-inforce their imaginary solitude bubble, before shuffling on to the plane clutching the boarding pass, silently waiting to take your seat and being oh so patient with the person in front holding everyone up while they take an eternity to stow their belongings away on the shelf. Finally taking your seat and immediately hiding behind a newspaper so you do not have to acknowledge the person next to you, all the time playing the “who can dominate the armrest” shuffle. Then settling down for a nice quiet, undisturbed flight. 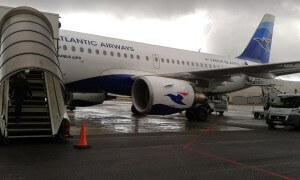 I can assure you that the Atlantic Airways experience to Vágar Airport, Faroe Islands could not be more different! The first thing to strike you will be the familiar greetings as new passengers, joining the check-in queue, recognise their neighbours, work colleagues, even relatives, so instantly the queue is made up of groups huddled in animated conversation and laughter. You are flying to a country which has a population of under 50,000 residents, there is only one airline and the atmosphere from check-in to landing is one more akin to a family Sunday coach outing. However, make no mistake, this is a high quality coach outing, especially since Atlantic Airways introduced the latest Airbus 319 to the fleet (with another Airbus 320 on order), so no cramped seating here, it’s luxury all the way, including free food and drinks. The people of the Faroe Islands consider this their very own airline and having traveled with a few “no frills” airlines across Europe recently, I can confirm that there is a huge sigh of relief and contentment stepping on board a “proper” airline to take you back home. Almost immediately after take-off you will hear the mass unclicking of seatbelts as Faroese passengers move instantly up and down the gangway to talk to their friends, family and colleagues and the plane is filled with noisy chatter all the way. The air stewardesses are also Faroese and therefore known personally to most Faroese passengers, so be prepared for much friendly chat as the obligatory in-flight meal is served together with an abundance of liquid refreshment and complimentary alcoholic drinks. (Although the airline has floated the idea of scrapping free food and drink in favour of cheaper fares, a subject of much speculation and debate on the islands right now). Fully expect to be willing to reveal your life story and purpose of your visit to your neighbouring passenger as soon as they discover that you are a foreign visitor and do not be surprised to get off the plane with at least one invite to someone’s home. If you are lucky enough to be travelling in the daytime, you will also have the delight of seeing the islands as they emerge through the cloud from the ocean below. Always a magical experience, as if you are descending into a Tolkien landscape straight from Lord Of The Rings, the magic enhanced even further if you approach low over Sørvágsvatn, a large lake which looks as though it is emptying it’s overflow over the high cliffs into the mass of the North Atlantic. The landing is always dramatic, it is a fairly short runway so lots of heavy breaking and do not be surprised to hear the passengers give out a hearty cheer on landing or even a round of applause. I am still not sure if this is an outpouring of delight to be home or sheer relief. The final act of the arrival experience is one that always warms the cockles of my heart. © 2017 Heimdal Tours. All Rights Reserved.